Mira Rai: How A Girl From A Remote Nepali Village Became A World-Class Trail Runner : Goats and Soda She dreamed of a better life outside her village in Nepal. But she was broke and had run out of hope. Then she tried a 31-mile trail race. Rai competes at the 2014 Manaslu Trail Race, which passes through Nepal's Himalayan landscapes. Mira Rai is perched on the edge of a couch in Kathmandu in a bright yellow Salomon windbreaker and track pants. The 29-year-old is recovering from knee surgery but looks as if she needs to jump off the couch and burn energy on a mountain trail. Trail running is, in fact, what the Nepali athlete is known for — along with her unlikely journey from school dropout in a remote Nepali village to Maoist child soldier to national sports hero featured in children's books and depicted in murals. There's now a constant buzz around Rai. And only part of that is due to the nonstop vibrations of her cellphone, as she gets inundated with requests for interviews and for face-to-face time from fans. Less than three years after entering her first trail race, Rai has solidified her position as a top ultrarunner, earning titles across the globe in grueling mountain races up to 110 kilometers long — or 68.3 miles. She bagged her Salomon sponsorship in 2016 and was declared National Geographic's Adventurer of the Year in January. In early February, Nepal's youth and sports ministry announced its plan to award her three million rupees (about $30,000) for "spreading the name of Nepal all over the world," according to the ministry's secretary Mahendra Prasad Paudel. Rai's celebrity status in Nepal is no small feat considering that her specialty is extreme distance running — think marathons but much longer and across steep, rocky terrain. It's an athletic pursuit that's considered borderline absurd in Nepal. "They said this is not a sport. Why do you run?" Rai says of the reaction she gets back home. Despite the country's strikingly ideal landscape for these races, for most Nepalis, trudging up and down the endless ripples of hills is the stuff of daily life rather than recreation. Rai unwittingly began her training by helping her mom carry necessities like salt and oil from the market to their home deep in the hills of eastern Nepal. Rai remembers all of the early mornings when she ran to the jungle to cut grass for her family's livestock or fetch water before school. She'd run the 45 minutes to school too, typically on an empty stomach. By age 12 it was getting tough to afford the pens and notebooks and uniform to stay in school, so she quit to earn money to help her family. She wasn't happy with the bleak future she saw before her. "I wanted to do new things," she says. "In the village there's no chance, every day watching goats, planting corn or millet, and then working in the fields every day." 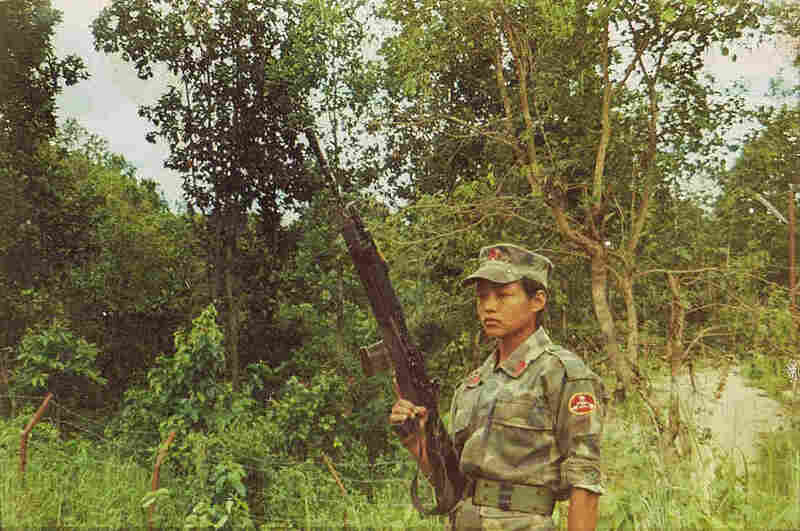 In the early 2000s, a civil war was ripping through the hills and the Maoist rebel army was taking recruits. To 14-year-old Rai, signing up was an opportunity to escape a life of manual labor and, in keeping with local customs, early marriage. In her three years with the army, she didn't see combat, but she practiced karate and ran in battalion races as part of her training. When Nepal signed a Comprehensive Peace Accord in 2006 and eventually integrated Maoist rebels into the national army, Rai was still a child soldier and not eligible to join. She was taken in by a karate coach she had met through the Maoists — the same coach she still lives with today to keep expenses to a minimum. Rai continued running and practicing karate as she looked for another opportunity. With a grade school education and no money to support training, she didn't have many prospects. By 2014, she was totally broke and about to give up on her dream of a better life outside her village. That March, Rai wound up running in a national park in Kathmandu with some guys from the Nepalese army, who told her to come back the following Saturday. What Rai thought was another training run was actually the 50 kilometer Himalayan Outdoor Festival race, hosted by a new company, Trail Running Nepal, which was started to grow the sport in Nepal and support Nepali runners. Until that point, Rai had mostly been her own coach, running long distances on roads but never tackling the distances or terrain of ultraracing. "I didn't know! I thought [it was] just training, and then [I realized], 'Oh my god, this is a race!' And then I felt like I [could] do it," she says. Actually, despite never having run that distance before, she crushed it. Rai, the only woman to complete the grueling course, finished in about 9 hours (which included 45 minutes waiting out a hailstorm and another 15 minutes searched for washed away trail markers). That put her just two hours after the male winner and made her the number one female racer. Without money for food, and just a pair of "very simple shoes, not OK shoes," Rai won her first ultra event and a 7,000 rupee (about $70) prize. With a laugh that slips out often, Rai says the punishing race was very tough, but "similar to my village [and what] I did everyday: carrying water, and going to the jungle, cutting grass." Richard Bull, the race organizer and founder of Trail Running Nepal, recognized that Rai had the raw talent and attitude to go places: "You have to be hungry, slightly intelligent, [with] a bit of personality, because [otherwise] you're not going to get very far." Bull says races of 10 plus hours across steep and often rocky terrain require a certain mental endurance and sense of calm that Rai seemed to have. But Rai was short on cash for food, let alone training. Bull pulled together donations from other runners to see if she had a chance to go pro. To compete, she had to get out of Nepal, where there wasn't much of a competitive distance running scene. Six hours after she got the visa for her first international race, Rai was on a flight to Italy, where she bagged first place in both the 57-kilometer Sellaronda Trail Race and the 83 kilometer Trail Degli Eroi. After that, Rai's CV boasts a stunning string of wins including a new course record at France's Mont-Blanc 80 kilometer of 12 hours and 32 minutes, and a second place finish at Spain's Ultra Pirineu, a 110-kilometer race with a 6,800-meter vertical incline, which Rai says she enjoyed too much to feel tired. Clips of her racing show her beaming at finish lines with a Nepal flag wrapped around her neck. Rai logs countless hours on Nepal's hills to train for these brutal races. Despite her hard work, she knows she's lucky — in her country, women don't often get to dream big. "My grandma, she worked hard, my mom, she worked hard, but they didn't have a chance to do something, to get respect," Rai says. "I went around the world, which nobody ever got that chance, from my family or village." She wants to translate that chance into opportunities for other young people, especially girls. A 2014 survey by the Nepal government and UNICEF reported almost half of Nepali women were married before age 18 and about 16 percent before age 15. The same survey said just 28 percent of Nepali young women had ever used a computer. For now, Mira Rai is a rare model of what's possible. A Nepali arts organization screened a documentary about her life, "Mira," in schools across Nepal last fall to inspire students. In one scene, she travels home and shows off her magazine clips as her family huddles around her. "You look like a boy," Rai's mother tells her in Nepali, laughing. Small kids smile at each other as they try on her medals. Rai shows a picture of another runner to her family. "I have yet to win against her. She's also a great runner, but I think if I work harder, I can win." Rai wants to help more Nepali women win along with her. Due to a knee injury, she had to sit out December's Lantau 50 in Hong Kong, a race in which she took second place back in 2014. Instead she accompanied two teenagers from the remote west of Nepal, both of whom were running their first 50-kilometer race there, to help them navigate the event and their first trip abroad. One of them, 18-year-old Sunmaya Buddha, carried Rai's torch, taking second place behind France's Caroline Chaverot. "Girls get married at 15 or 16 and because of that many people call me old." Buddha says, of her village in Jumla, Nepal. "I don't think like that. I want to go to other countries and run." 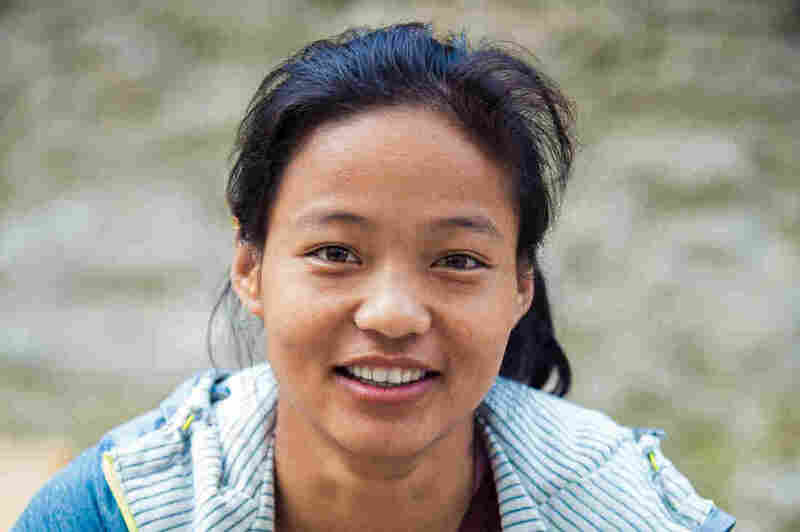 Rai hopes her National Geographic Adventurer award will pull more undiscovered athletes out of the hills and show more girls (and their families) that they have a right to dream. She hopes to use the platform to do more on behalf of Nepali women and girls. But Bull says she also needs to make sure she has a plan for her own future to avoid sliding back into poverty later in life herself. "She wants to help others, but first she wants to help her family," he says, noting that a lot of people are telling her, "Look you did so well and look at us left behind." Plus, she's still trying to learn English and make up for her years out of school. It's a lot of pressure for her — and her overloaded cellphone. But Rai is getting the hang of it. She ends the interview like a true celebrity, grabbing the phone and asking, "Don't you want to take a selfie together?"